The Seattle Great Wheel wheel lights up Pier 57 and changed the Seattle waterfront forever. 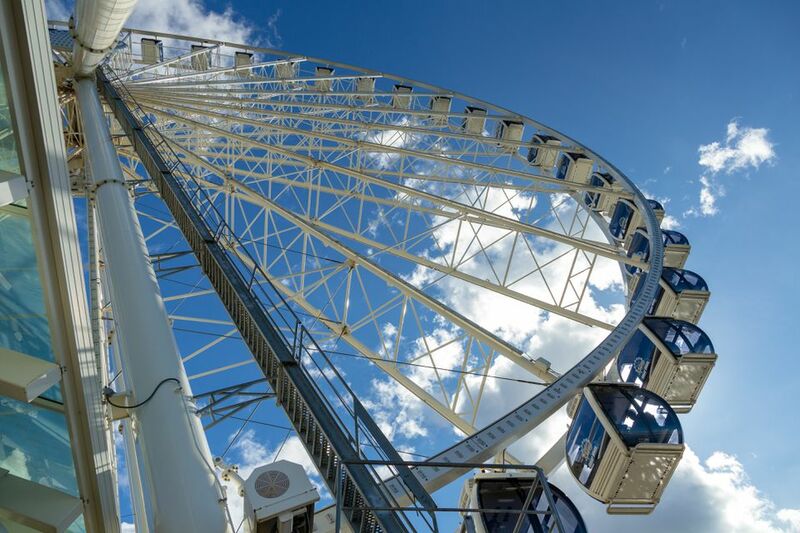 With fully heated or air conditioned gondolas and spectacular views, this Ferris wheel is a great attraction to dazzle out-of-town guests, but fun for locals, too. Decked out in thousands of LED lights, the wheel can put on a spectacular light show for sports events or holidays. The lights have the ability to do a variety of things—swirl, flash, and other patterns or even celebrate the team colors of the Mariners, Seahawks or other local teams. Even if there isn't a special light show, the wheel is always illuminated at night. The Seattle Great Wheel is one of the best attractions in town for one reason. It's got some spectacular views. Sure, you can go to the top of the Space Needle, but this giant Ferris wheel is perched right on the water so has a unique advantage for anyone who loves water views. Riders board gondolas that seat up to to eight people at a time, so you probably won't have a gondola to yourself if you're in a smaller group, but there's enough space you'll still have plenty of access to the views. The wheel’s gondolas are enclosed and have heating and air conditioning so that riders can enjoy this ride all year round. The views are spectacular from all sides—the Puget Sound, Seattle skyline and mountains will all be visible on clear days. On cloudy days, views are still good, but if you at all have a chance to wait for a clear day, it's worth the wait. At their farthest point, the gondolas are 40 feet out over the water. Some of the gondolas have glass-bottomed floors, too, which makes dangling out over the Puget Sound a little more exciting. If you're looking for a little something extra for your Great Wheel experience, consider a VIP gondola. VIPs get only four people to a car that's decked out with four bucket seats, a stereo system and a glass floor to add a little extra oomph to the already cool views. You also get a champagne toast at nearby Fisherman's Restaurant, a souvenir shirt and front-of-the-line privileges. People per gondola: Up to 8. Depending on crowds, smaller groups might have a gondola to themselves or might not. You can buy tickets either on a walk-up basis or online in advance. What Else Can I Do on Pier 57? Pier 57 has an old-timey appeal to it, complete with a vintage carousel and a game arcade. There are a few stores here, including Pirates Plunder, Zongo Gifts, and The Sports Den and a few restaurants as well. Another highlight of Pier 57 is another ride that opened in mid-2016 called Wings over Washington. If you're not a fan of heights, Wings over Washington might be just the right amount of thrill as it only simulates heights and flying, but you're not far off the ground at all. It also offers a fantastic preview of the entire state in a unique way. There are plenty of other things to do nearby too since the Seattle Great Wheel is right on Seattle's touristy waterfront. Pike Place Market, the Seattle Aquarium, and downtown Seattle are also within a walking distance of two to ten blocks. When Did the Seattle Great Wheel Open? How Does Seattle’s Ferris Wheel Measure up to Others Around the World? At 175 feet high, the Seattle Ferris wheel is quite a bit shorter than some of the tallest Ferris wheels in the world. As of mid-2012, the tallest are: Singapore Flyer at 541 feet, Star of Nanchang at 525 feet, London Eye at 443 feet, Suzhou Ferris Wheel at 394 feet, and The Southern Star at 394 feet. However, the Seattle Great Wheel is the tallest great wheel on the entire West Coast! The Texas Star Ferris Wheel in Fair Park, Dallas, Texas, at 212 feet.